One of the secondary stories from Computex was that AMD and its partners were set to launch a new generation of mid-range chipsets and motherboards with the new lower-power version of the chipset. The B450 chipset is the direct successor to B350, with lower power and features such as Precision Boost 2, XFR2, and StoreMI support. 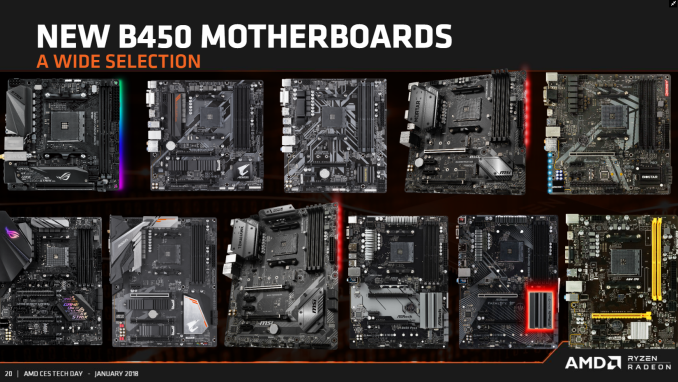 The planned release of 25+ motherboards models is sure to add variety to the market and we take a quick look at all the boards ahead of the launch from vendors such as MSI, ASRock, ASUS, and GIGABYTE. What's New with the B450 Chipset? 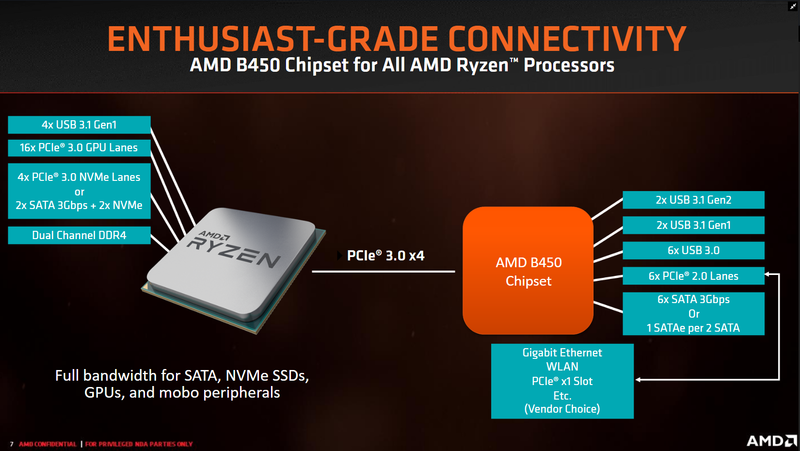 The new B450 chipset launch compliments the release of the Ryzen 2000 series processors, with AMD looking at its current mid-range and high-end parts. The B450 chipset is designed to be a cheaper entry point into the ecosystem, even for users picking up the eight-core Ryzen 2700X ($329) and hex-core Ryzen 2600X ($229) units and going to overclock. Like the already released X470 Promontory chipset, the B450 chipset is the direct successor to previous first generation B350 chipset. 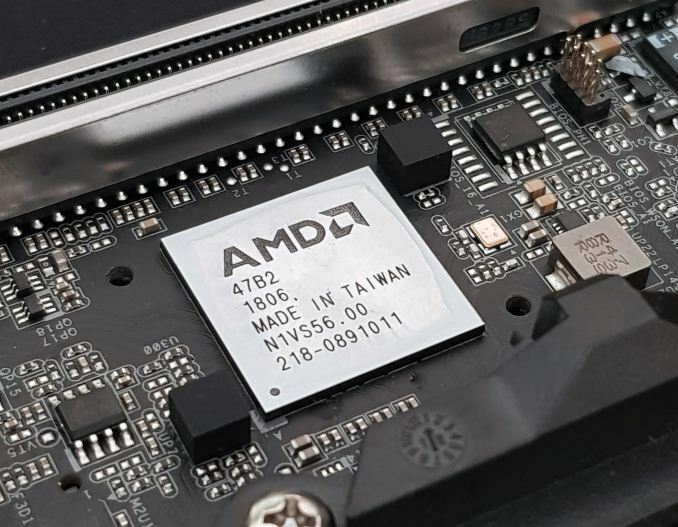 Not much hasn’t changed on the surface in regards to USB connectivity, storage options and PCI lanes, however AMD has added a couple of new technologies to bolster the appeal of the new budget-focused chipset. While the specifications on the surface make the B450 seem like a carbon copy of the B350 chipset, as they share native support for the same USB configuration, the same SATA configuration, support for a single M.2 PCIe 3.0 x4/SATA port, and six PCI lanes dedicated to PCIe 2.0 slots. They also both enable support for the same PCIe 3.0 bifurcation, giving a single PCIe 3.0 x16 slot, focusing these systems on a single GPU. As with the jump from the X370 to the X470 chipsets, a primary difference from B350 to B450 come through lower power consumption - the B450 chipset runs a lower powered integrated controller which reduces the idle power draw by just under 2 W, from 6.8 W to 4.8 W.
Another big feature is AMD's StoreMI storage technology which isn’t necessarily an addition to the chipset itself, but enabled through B450. This enables users to unify the various storage in their system to make the best arrangement for the fastest access to data. 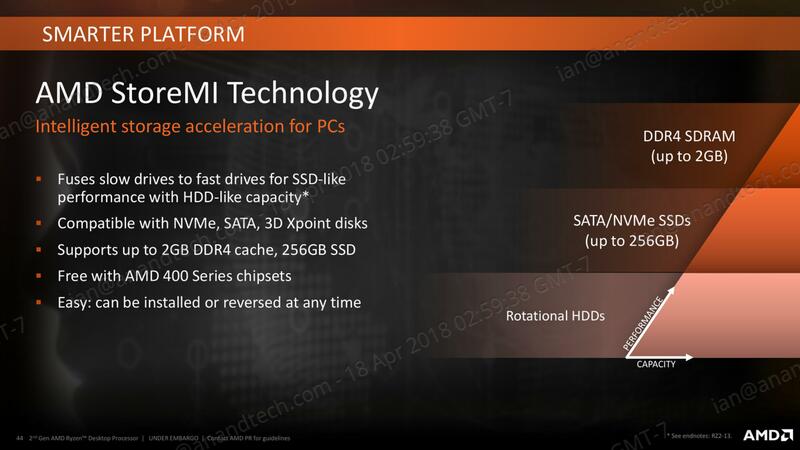 The StoreMI technology is explained further in our Ryzen 2700X, 2700, 2600X and 2600 processor reviews. 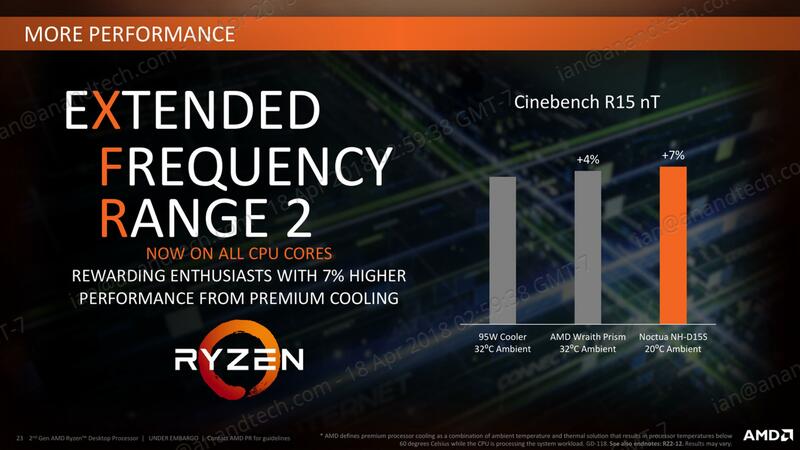 One of the biggest changes, related to the Ryzen-2000 series, is in how the processor implements its turbo. Up until this point (except the recent APU launch), processors have relied on a step function implementation: the system determines how many threads are loaded, attempts to implement a specific frequency on those cores if possible, and then follows the look-up table relating thread count to frequency. AMD’s goal in Precision Boost 2 is to make this process more dynamic. Extended Frequency Range 2 (XFR2): Cooler = Faster, Right? 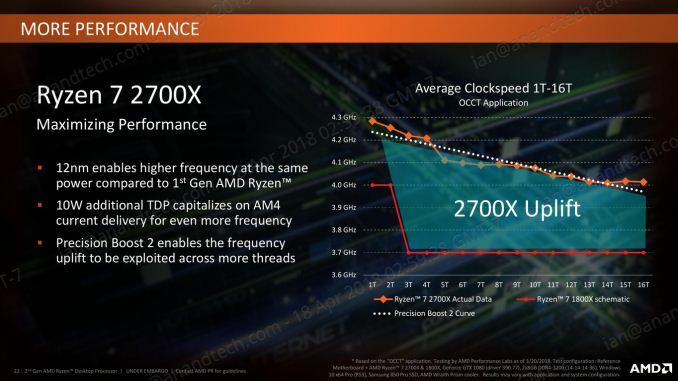 The following analysis on XFR2 comes from our previous AMD Ryzen 2700X, 2700, 2600X and 2600 review. 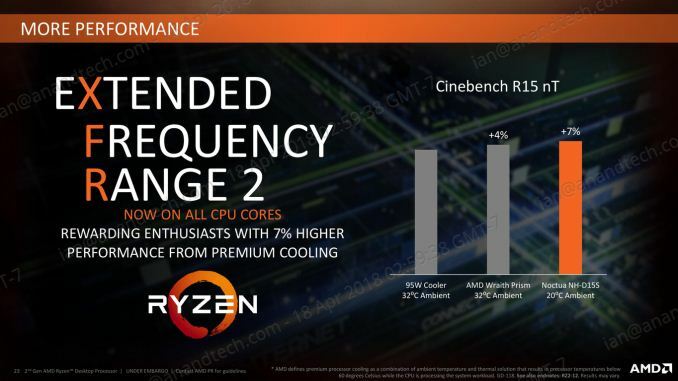 For the Ryzen 2000-series, AMD has changed what XFR does. In the previous generation, it was applied on certain processors to allow them to boost above the maximum turbo frequency when the thermal situation was conducive to higher frequencies and higher voltage in low thread-count states. For this generation, it still relates to thermals, however the definition is applied to any core loading: if the CPU is under 60ºC, the processor can boost no matter what the loading is above its Precision Boost 2 frequency (so why not get a better PB2 implementation?). The core still has to be within a suitable voltage/frequency window to retain stability, however. Both Precision Boost 2 and Extended Frequency Range 2 are supported on B450. Gavin, you made a table that shows B350 and A320 don't support PB2 and XFR2. This is incorrect. Raven Ridge (2400G, 2200G, 2X00U) work without a problem on these boards. Yes, Raven Ridge has PB2 and XFR2 from day one. AMD advertised it when they launched RR last year. If you buy the boards directly from there amazon store or on there website they should be Stock updated. StoreMI can work on 300-series motherboards but comes with an additional fee (I don't think it's BIOS dependent).